As you may know, I began my Yoga Teacher Training in October. So far it’s been a great experience not only learning the in’s and out’s of how to teach poses, we are also learning the broader concepts of yoga. Last week were were asked to begin a meditation practice. We are lucky to already have a weekly meditation group at work that I attend regularly, but now I was tasked with meditating every day! When I skipped practice at home in the morning, I found a quiet place at work (you may have quiet rooms you may not be aware of). That’s when the idea came to me to bring more of what I was learning in my teacher training with me every day. Breathe, breathe, breathe and then breathe some more. Even taking two deep breaths in a row calms the nervous system and can make us less less reactive to any grabs that come up in our work day. Move your body every hour. Sitting for long periods of time can be bad for our posture, concentration, and overall energy. Take a body break at least every hour with a couple of the chair yoga exercises listed in the chart below. Slow down your typing. It’s easy to get caught up in the onslaught of responding to so many emails. I caught myself the other day racing away at my responses and I listened to my internal voice going a mile a minute. Slowing down just a bit can bring a sense of ease and more calm. Listen actively to your colleagues. There is nothing like giving someone your full attention. It makes them feel heard and appreciated. So next time your are on the phone, refrain from typing away at that email. At a meeting, play closer attention to what they are saying and give them plenty of time to finish their thought. Listen to relaxing music. I have Spotify downloaded on my computer at work where I have an unlimited supply of relaxing music at my fingertips. I choose the commercial Premium option and find the $9.95 price tag well worth it. You don’t need yoga pants to move your body either. 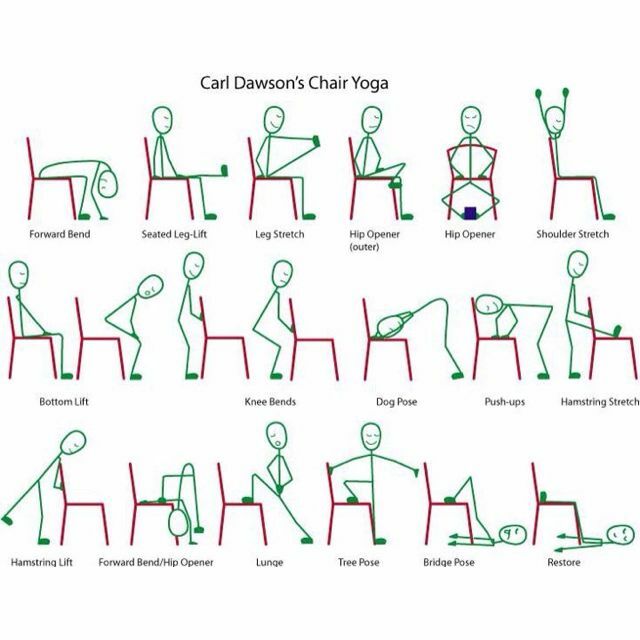 I found this great chart from Carl Dawson who is a bit of an expert on chair yoga. I would suggest finding a chair without wheels for some of the poses that he shows!